Hashish Around The World: Is Lebanese Hash The Best? Lebanese hash is hard to find, but what makes it so great? Kicking off our Hash Around The World Series, we’re giving you the wonders of Lebanese hash. Lebanon is famous for its quality hash. Yet, this treat is very hard to find on the market. Not only is it illegal domestically and internationally, but cultivation crackdowns are threatening local farmers. To kick off our Hash Around The World Series, we’re giving you a glimpse into the wonders of Lebanese hash. Like most places in the world, cannabis is illegal in Lebanon. Still, that hasn’t stopped the Lebanese from making some of the best hash in the world. Most cannabis is grown in the Bekaa Valey, an extremely fertile strip of land in eastern Lebanon. The valley represents the heart of Lebanese agriculture, a prime location for cannabis cultivation. Growing cannabis for hash is a lucrative job for many rural farmers, though it comes with a high price. While cannabis cultivation usually soars during times of social and political strife, government crackdowns are devastating to farmers. One raid last year took over 800 kilograms of hashish off the market. A loss like that isn’t easy for farmers looking to make a living. Nor is it helpful for those hoping to preserve increasingly hard to find Lebanese landrace strains. The crackdowns have lead to something akin to farmland warfare between farmers and the state. Famers are desperate to hold onto their crops, and the state is desperate to take them away. When state buldozers arrived, the farmers fought off security forces with heavy machine guns. The standoff only ended when the state promised to provide money to the farmers for new crops. Money which never arrived. The conflict and tension surrounding Lebanon’s hash industry are harmful to farmers, civilians, and security forces alike. Yet, strict international cannabis laws only continue to fuel black market production, which in turn opens the doors to violence. The no-tolerance policy also prevents the world from enjoying a supremely high-quality product with centuries of production. What makes Lebanese hash so good? 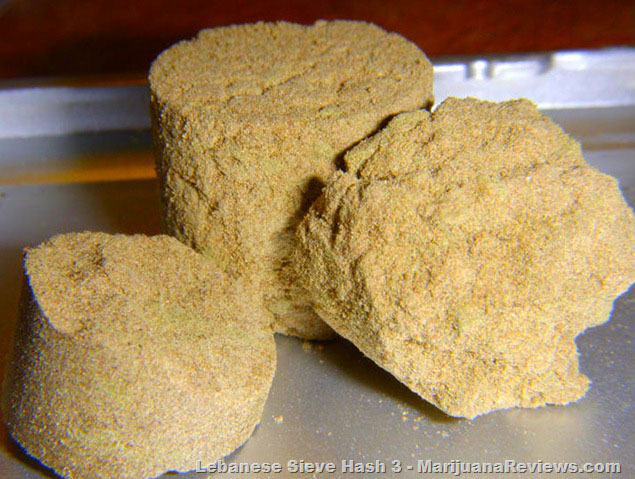 Lebanese hash comes in two common varieties, yellow and red. Though some argue that yellow and red are two separate strains, they are made with cannabis harvested at different stages in the growth cycle. Yellow hash is made from plants harvested early when they are high in THC and produces nice cerebral effects. Red hash comes from plants that are a little bit older and are said to contain higher amounts of non-psychoactive CBN, making it milder though still wonderfully potent. Hashish has quite a long history in Lebanon. At one point, the cannabis-gold was even used as a currency. So, it’s safe to say that the Lebanese know their stuff when it comes to making amazing cannabis products. Once the hardy indica hash plants are harvested, dried, and cured, the hash can be made. Producers often use a silk screen method to extract reddish-gold resin glands. Then, all of this kief is stored through the end of fall. Once wintertime rolls around, it’s hash pressing season. Kief crystals are transferred to cotton or linen bags and pressed. This creates a soft, crumbly, smooth hash brick. If you’re lucky enough to come across some real Lebanese hash, you won’t want to pass it up. This soft, golden treasure is often imprinted with the country’s trademark cedar tree and produces a smooth, relaxed high. Finding some landrace Lebanese hash seeds is also a luxury these days. Though, there’s nothing like a Lebanese strain grown in its home environment. Have you tried Lebanese hash? Share your story with us on social media or in the comments below. We’d love to hear from you!